How is the liquor category faring as the global duty free and travel retail industry prepares for its annual gathering in Cannes? After a strong finish to 2013, the global liquor category in duty free and travel retail coasted in the first few months of this year according to Generation Research. Turnover from January to April 2014 was 5.6% ahead of last year, down from the 6.3% lead recorded at the end of December which valued total category sales at just under US$10bn for the 12 months of 2013. Asia Pacific continues to grow fast at 9.7%, accounting for nearly a third of global sales by the end of April this year. Although larger, Europe’s share slipped to around 38% on the back of slower progress at 5.3%. Channel-wise, airport stores remain travellers’ preferred shopping venue for drinks with nearly 55% of all transactions by value between January and April. An increase in international passenger traffic through airports is usually good news for duty free and travel retail wine and spirit sales. The half-year figures to June 2014 from Airports Council International show a 5.7% uplift versus the first six months of 2013, marginally ahead of the 12-month rolling year benchmark of +5.5%. Adding in domestic traffic for an overview of total passenger numbers, Europe led the charge in June with 6.1% growth, while the normally vibrant Asia Pacific region recorded a muted 3.3% increase. Strong performances at some locations like Tokyo (+7.6%) were offset by softer numbers from airports such as Jakarta (-6.9%). Beijing, the source of impressive growth recently, was almost flat at +0.1% in June. Regulations limiting passengers’ ability to take liquids and gels (‘LAGs’) on board aircraft have been a headache for duty free retailers and liquor suppliers alike, so recent work by industry associations with the EU, North American and other authorities to reduce their impact has been welcomed by many. Duty Free World Council (DFWC) president and board member of the European Travel Retail Confederation Frank O’Connell says the introduction of a revised regime for transfer passengers to Europe and North America in January has gone smoothly: “To date there have been no major problems reported and I would again urge retailers to take advantage of the opportunities offered by the new regime”. While airports and retailers have adapted “very well” to the changes, which include enhanced scanning procedures, O’ Connell thinks it “unlikely” they will be adopted “any time soon” beyond the current area (EU, Switzerland, Norway, Iceland, USA, Australia and Canada). Speaking of the future, he commented: “The current plan is to lift all LAGs restrictions in two further phases in 2015 and 2016, however this depends on the success of each preceding phase” and the DFWC President believes it is “too early” to say when this might happen. 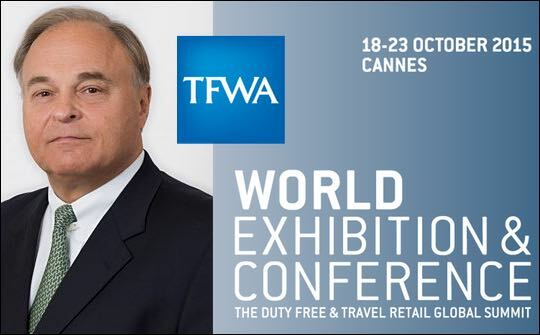 October marks the 30th anniversary of TFWA World Exhibition & Conference, duty free and travel retail’s global gathering in Cannes. From modest beginnings the event has grown with the industry and last year hosted 6,303 visitors who came to see 470 exhibitors in over 21,000m2 of floorspace. To celebrate the event’s 30th year a number of festivities are planned including a Charity Run in aid of the causes supported by TFWA Care, a 30th Anniversary ribbon-cutting ceremony with cake and champagne plus several surprises during the week’s networking programme. Over the past 30 years, TFWA World Exhibition & Conference has become an integral part of global duty free and travel retail. Like the industry it serves, it has dealt with some difficult challenges but possesses remarkable resilience. I’m especially encouraged that exhibitor bookings are so healthy in this, our anniversary year. If matched by another increase in visitor numbers, it will show how vibrant duty-free and travel retail is as we enter our 31st year. Following last year’s record attendance, TFWA World Exhibition & Conference 2014 (26-31 October) promises another busy week in Cannes. The conference will hear from Air France – KLM Chairman & CEO Alexandre de Juniac on the international travel market, former US Secretary of State Colin Powell on leadership in challenging times and as TFWA president, I’ll review our industry’s progress over the last year with the help of the latest research data. Champagne Laurent-Perrier is among those exhibiting in Cannes for the first time this year or returning after a break, a list that includes large players like Treasury Wine Estates as well as smaller entrants such as Armagnac Castarède. The liquor category is among the best represented at the exhibition, occupying nearly a quarter of all stands in 2013 as the second largest sector, a ranking it will retain this year. This is well above liquor’s 16.4% share of total duty free and travel retail sales last year in Generation Research figures, reflecting wine and spirit companies’ strong presence (almost 30%) in TFWA’s brand-owning membership.